Summary: Sea turtle research programs initiated over the last five decades have generated critical information for the conservation and management of sea turtle populations. Data from many of these studies of sea turtles in Florida, and around the world, are in danger of being lost in the relatively near future as the originators and holders of these data age. If the data are not preserved, valuable and irreplaceable data will be lost, with serious consequences for the conservation of sea turtles. 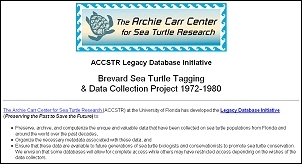 To preserve these data, they must not only be computerized, the data must be carefully documented with the methods used in their collection, such as descriptions of effort, how turtles were measured, etc. Collectively, this associated information is call “metadata.” These datasets, and the accompanying metadata should be made available at a permanent website, so that all biologists, conservationists, and managers can access the data. We will use data collected by Billy J. Turner and his team on Melbourne Beach, FL, from 1972 to 1980 as a model dataset to develop the procedures and demonstrate to other biologists how their data can be preserved as a legacy for the future. Results: This project has been completed successfully. All data have been computerized. A website has been established at http://accstr.ufl.edu/legacy.html. All metadata associated with the project have been provided on the website. The availability of the first Legacy Database has been announced on two listservs: CTURTLE and MedTurtle. The database has already been requested by and sent to several sea turtle biologists. The Sea Turtle Grants Program has been and will be acknowledged on all websites, presentations, and publications of this project.